More of the top 11…. So to continue with the Top 11 cupakes and my thoughts about them…..
Fluffernutter from Cake Fetish in Albuquerque, NM. I pondered doing fluffernutter for “F”, but French Toast won out. (Thanks for Mr Shuck for suggesting.) If you haven’t had a fluffernutter sandwich (PNB and marshmallow fluff), you should try it at least once. It’s more of a dessert sandwich than a meal sandwich, but not as tasty as a Nutella and marshmallow fluff sandwich. Cake Fetish has some imaginative flavors and extremely cute decorated cupcakes. Albuquerque is on my list of places I’d like to visit (or at least airports I need to fly into to get to the other places), so maybe I’ll get to have a Cake Fetish in the future. 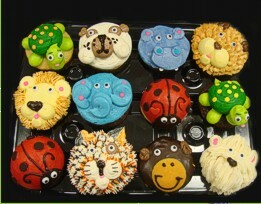 Cake Fetish animal cupcakes: Stolen from their website. Orange Ginger at Lilly Jane’s Cupcakes in Eagle, Idaho. I supposed it’s imaginable to end up in Idaho one day. I have driven through Idaho once. They seem to have some imaginative flavors. The caramel macchiato/mocha sounds good: A choice of our moist vanilla cake, or rich chocolate cake soaked in home-made caramel & topped with an espresso buttercream and (again) swirled in our homemade caramel. There was no mention of the Orange Ginger or the Caramel Apple flavors mentioned in the article on the bakery’s website, so maybe they were limited time specials. 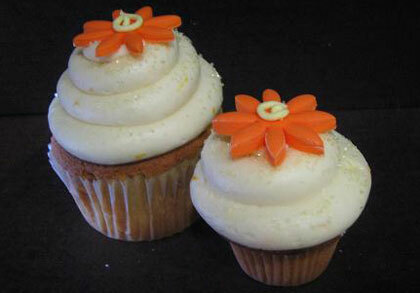 I don’t know how I feel about an orange cupcake, but citrus and ginger are typically good together. Orange Ginger cupcake, stolen from MSN. Lemon Coconut from Back in the Day Bakery in Savannah, GA. I’m originally from Georgia. It’s possible I could end up in Savannah. I really like their logo, which I stole from their website. It’s very shabby chic. Back in the day masthead: Stolen from their website. Go visit them. This bakery also has banana pudding daily. Actually it’s on their menu as ” Nana Puddin’ “, which leads me to believe it’s got to be good. I do love a good lemon cake, so I’d try the Lemon Coconut cupcake too. They should have descriptions on their website though of their dessert items. Reading a good description will get me out and running for cake. 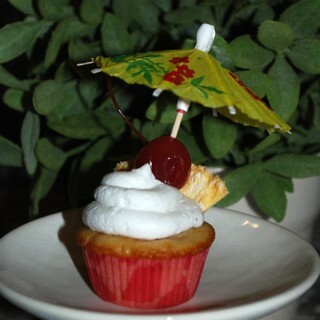 (See “Cupcake Snobery Again“).